awoke & took a look at the weather. hmmm... it was, to say the least, somewhat inclement. a pattern was emerging. partook of breakfast, which was not the best meal which i have ever ingested. the milk was off, and the cooked course was little more than edible. to be fair though, we called unnanounced, way out of season and on a saturday evening, so i shall give the proprietor the benefit of the doubt. we paid our bill & set off in what most sensible folk would agree were appaling conditions. the strength of westerly wind was somewhere between strong breeze and gale force, and it was raining. hard. it was also very cold. rather than re-trace our steps (or would that be revolutions?) along the c2c, we decided to join the official path close to its source by following a different, more direct route. but fisrt things first, it was off to the metro station to have the reviers' route card stamped. this proved more difficult than the completely straightforward task one would expect (and this was to become a regular feature). the stamp had been locked away, and there was a prevailing sense of incredulousness that hardy folks were attempting to tackle the route at this time of year. the signature of a suitable authority (the proprietor of the cafe) had to suffice in the absence of the official stamp. we now set off for the route proper. the way chosen was not the most cycle-friendly one possible (grand parade, beach road) and the wind was very strong and very against us. this was not the fun it was supposed to be. after a mile or two, we reached the sustrans path and joined it, with some relief. this feeling was short-lived, howerver, as the path soon degenerated from hard-core to deep mud. although officially open, the path was only half finished. we ended up shin deep in mud & water. making progress in this was about as easy as herding cats, and finally we had to abandon the official path and seek refuge on the roads. negative browny-points and a slapped leg for sustrans. we navigated our way to ponteland, by mostly unfriendly main roads. once there we dismounted for a warm-up walk. we were both soaked, freezing, and hands and feet were aching. 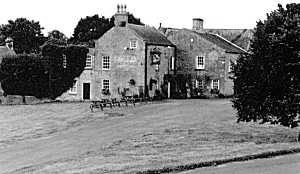 although dying for a pint and some warmth, we could not agree on a pub to patronize in ponteland, so we headed out of town on much more friendly minor roads. the weather was even a little better (but only a little, mind). the last leg of the journey to stamfordham was much less unpleasant, and we came dangerously close to enjoying ourselves. 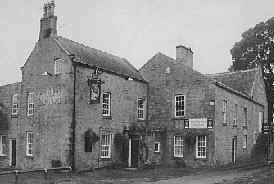 the bay horse inn at stamfordham was a welcome sight. we arrived at about 15:00, which was more or less on schedule. it was kicking out time for the poor locals, which was good news for us, as this meant that our hosts, Eric and Linda Jordan, had time to welcome & show us to our accomodation, which included drying facilities and modern, clean bedrooms with en-suite; we'd landed on our feet. furthermore, because we were the only guests staying that evening, the landpeople offered us seperate rooms at no further cost. now, you can't complain at that. well you could, but you'd have to be fairly strange. our bikes were locked in an outbuilding for security. lou plumped for a bath straight away, i decided to explore the delights of the bar first. i was ready for a pint & was also a little peckish, i'm sure the bar snacks were calling to me as i walked past to check in. the beer recommended by the landlord was 'mordue - geordie pride', and it turned out to be a rather fine quaff, i second the landlord's recommendation. as i was now the only person in the bar, i got talking with the landlord, who was very interested in the reivers route, and perused the map with me and pondered the next stage, to falstone. he is a keen cyclist himself, and suggested an alternative, he even printed-off a copy for us on his computer. the landpersons, it transpired, had recently taken over the pub, have grown disillusioned with their previous careers, electronics and teaching, i think. after a couple of pints i wandered up to have a bath myself. baths are so good after a day in the saddle, even if one has only done 30 miles or so. we descended to the bar for some grub & a beer or many. the food on offer was not quite gourmet standard, but this was a sunday night. we chose the cumberland sausage, which was maybe not the best idea, as we're both cumbrian born & bred, and were raised on very high quality cumberland sausage. as it turned out, the meal was fine. i very much doubt that michelin stars would have been awarded, but we were after good, simple comfort food, and that's what we got. it was later than planned when we finally retired, as we had stayed in the bar drinking with our hosts. fortunately, i had my sensible head on that day, and tried to interleave with my alcoholic intake with drinks of water.